Our motto: “Luxury means space”. 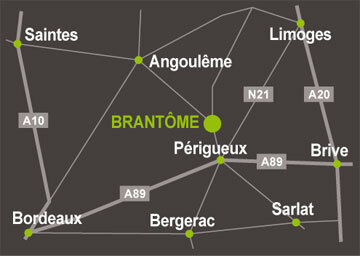 Our sunny, part-shaded or shaded pitches measure between 100 and 200m² on flat ground, crossed by the river Dronne which continues its way to the nearby town of Brantôme en Périgord, 900m away. As a result, you have all the benefits of the countryside and close proximity to the shops, restaurants and other services you need for your stay in the Dordogne. The pitches at our 3-star campsite in the Dordogne are equipped with European plugs (adaptors are on sale at reception) – don’t forget to bring an extension lead (minimum 25m). You can also rent fridges, tables, chairs, parasols and barbecues for maximum comfort during your stay at the campsite. During the high season from July 7th to August 20th, reservations are recommended with a minimum of 7 nights. For shorter stays you are welcome cause pitches are available every day. Your arrival is from 2pm and departures before 12pm. The campsite is closed to vehicles between 11pm and 7am. All our pitches are electrified (except the 10 camper van pitches). Our friends the animals are welcome within the limit of two dogs maximum per pitches (with extra charge). 6 people maximum are allowed per pitch.